Wow! The time passes and they grow so fast! Courtney just turned nine and Clare is five and a half. The joy these girls bring me is immeasurable. I always say to Amy that I feel like I win the lottery every day by getting to watch them learn, grow and change. Only some days I’d like to slow down the growing process. It’s amazing how fast it seems they are changing. This picture is one of my favorite semi recent ones. 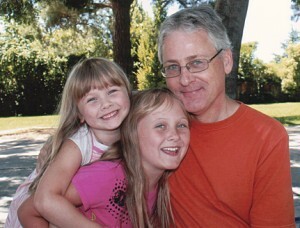 It was taken last father’s day, two days before Clare turned five. Wow, having an infant in the house, not to mention a four year old doesn’t leave much time for blogging. Clare is now 11 months old. So finally, here’s the rest of her birth story. We arrived at Kaiser a little after 4:00 PM. They checked us through triage in about 10 minutes. The OB said that Amy was already dilated 8 centimeters and this baby would be born soon. The nurses wanted to strap a monitor on Amy right away but she said no. So they persuaded her to wear it just long enough to get an initial “strip”. When Amy felt like the monitor had been on long enough, she said it was uncomfortable and started to take it off. The nurse took it from her and Amy never let them put it back on. They had to continually ask her if they could take a manual reading and then they would scribble the results on the original paper strip that was taken at the beginning. The lights in the labor/delivery room were dimmed and the nurses there were very helpful and always seemed to know what the other was doing. While Amy labored and pushed, they mostly helped her change into different positions. At this point I felt pretty useless. Then I found that I could be counted on to give Amy water when she wanted it. And so it was for quite a while that Amy either wanted to change positions, or the nurses would suggest a position change. One of the last changes was that they removed the whole end of the bed and put up a bar that Amy could hang on to while either partially seated or bracing against the remaining part of the bed. The last change was going to involve (at least partially) reassembling the bed. While the two nurses were starting to work on the bed, Amy was kneeling on the floor with some pads or towels under her. At that point I was in front of Amy and could see the silhouette of the round top of Clare’s head. Right about then Amy just felt like pushing, so she pushed Clare out right there on the floor. I remember giving out a tear filled yelp. Clare was moving immediately and she pinked up real fast. Amy told me to take off my shirt so I could hold Clare skin to skin right away. The midwife picked up Clare and suctioned her a tiny bit, blotted a bit of the excess moisture and handed her to me in a towel. I was holding her less than a minute after she was born. It was a wonderful moment. We were pleased that the only other person in the room during the birth, beside the nurses, was the midwife. 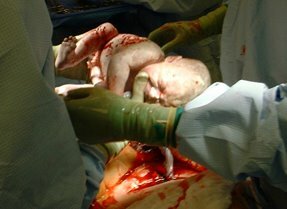 The OB was out of the room at the time of birth. Amy did tear a little, and as the midwife was cleaning her up and preparing her for the OB to stitch her up, she wanted to give Amy pitocin to guard against hemorrhage. Amy said no thanks, but if she was really worried about it, to give her a piece of the placenta to chew on. The midwife got kind of a frustrated look on her face and didn’t say anything because she could tell Amy had done her homework. We had gotten there too late for Amy to have any pain medication, which she wanted to avoid anyway. But after other medications were offered and refused along with this one, they presented Amy with a big page of procedures and medications that she had refused with a big line drawn diagonally through it and asked her to sign it. This truly was the drug free natural childbirth we wanted. The only thing we didn’t do was stay at home for it. After I went home and got Courtney from day care, I called Amy to see how she and Clare were doing. She told me then that they figured out what the pain was that made her want to come in. During her laboring at home and then later at the hospital, Amy had never gone to the bathroom to pee; but she drank a lot of water, so her bladder was full and that was causing a lot of pain. So even with a full bladder and no pain medication, she was able to push Clare out. Amy told me within a few days of Clare’s birth that giving birth to her the proper and natural way almost immediately completely erased the pain and horror of having had the unnecessary cesarean. Well, my wish to have Clare born on Father’s day was not fulfilled. I guess the little princess has her own agenda. Maybe she will actually be born on her “due” date of June 21. Nevertheless, I had a lovely Father’s Day. Amy and Courtney gave me several little goodies, but this picture in a large frame really made my day. Courtney has been so cute, talking to her little sister through Amy’s tummy. She likes to say “my Clare”. Well, although she will ultimately decide her arrival date, it seems we are entering the home stretch. Her “due” date is June 21, but babies seem to have their own agendas. We have decided to name our new daughter Clare Elise. I’m hoping she shaves a few days off the due date and is born on June 18, Father’s Day. That would indeed be the ultimate Father’s Day! Yesterday was Courtney’s third birthday. Here is the rest of her birth story. 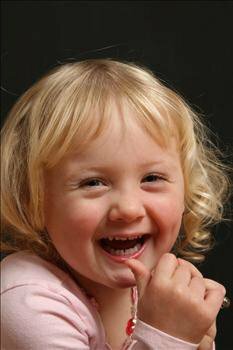 On February 12th 2003 during a prenatal visit, our midwife said that she thought Courtney was in the breech position. We thought this was odd since we were pretty certain that she was head down six days earlier. So we went to the hospital to get an ultrasound and yes indeed she was breech. Our midwife said when we hired her that she would not do a breech, mainly because she is not trained for it. We found that not many will. Even the hospitals don’t want to do vaginal breech deliveries because they don’t know how. So, on Thursday the 13th Amy set out to try all sorts of natural things to get her to turn back, like acupuncture, a chiropractic visit, homeopathic remedies. Nothing worked. On Friday the 14th(our 4th anniversary), she found some doctors at Kaiser hospital out in Vallejo(about an hour from us) that would schedule an immediate “external version”. That’s where they will try to turn the baby back with their hands from outside. That did not work and was painful to Amy. On the way home, our midwife took us to see another midwife who has done home vaginal breeches. Even she said it’s very risky and if there is a problem, there is usually no chance to go to the hospital in time. At this point I am getting freaked out, but Amy still wants to deliver at home, breech or not. We got home at about 9:30PM and celebrated our anniversary and went to bed late. On Saturday morning, February 15th, Amy got up early to call Kaiser in Walnut Creek to see if they could try again to do another external version. They said they could, so we went in. Before trying they checked Amy’s blood pressure and they thought it to be a bit high for her. So, just to be safe, they drew some blood and sent it down to the lab. The doctor came in and tried to turn the baby around again, but failed. He said it could be unsafe to continue trying. Since she was already full term at 39 weeks, he recommended doing a cesarean section. Since we were already there, and Amy hadn’t eaten since midnight it made the most sense, rather than waiting until going into labor and possibly having a problem delivering breech, according to the doctor. Amy wasn’t going for it. So, since we had to await the lab results before they would let her go, I went across the street to the bank to deposit my paycheck and called our midwife to ask what she thought we should do next. When I got back to the hospital, the lab tests came back and showed elevated enzyme levels in her liver and kidneys, an apparent early indication of pre-eclampsia, or so they claimed. The doctor said that this can get worse over weeks or even only days and is dangerous to mom and baby. The hospital was really busy that day, and the doctor needed to know soon so he could get the OR lined up, so we told him we were on for it. Meanwhile, our midwife and doula showed up and gave Amy (and me) some much needed support. They also said it was the best thing to do. I waited outside the OR as they prepared Amy for the operation. The two doctors and the attending pediatrician each came up and introduced themselves to me as they were preparing for surgery. The head doctor/surgeon was the same doctor who tried the external version earlier in the day. He is apparently one of their best surgeons. They brought her over to a table to the left of us to check her out and clean her up a bit. After about ten minutes they set her next to Amy and I took a couple pictures. Then it was off to the nursery for Courtney and me while they mended Amy and got her to a recovery room. After about an hour and a half, I wheeled Courtney in to Amy and picked her up and placed her in her mother’s arms. She breast fed almost immediately. In the summer of 2002, we moved into a new larger house because we had been trying for our first child. When we woke up on the morning after we moved in, Amy announced she had to pee. I looked at her as if to say “I know it’s a new house, but I know you can find the bathroom” and “You’re an adult, I’m sure you can handle it on your own”. But then it dawned on me that we were going to do the Early Pregnancy Test. It was positive and that was 6/23/02. In the coming months Amy did all kinds of supplementing, increasing various vitamins, etc. and we went to prenatal visits at Kaiser. We had already decided to use the Kaiser midwives for the birth. As we later found out, that is of limited value because they are governed by the hospital’s “doctors”. Along the way, we took a class in natural childbirth. It’s known as the Bradley “husband coached” method. 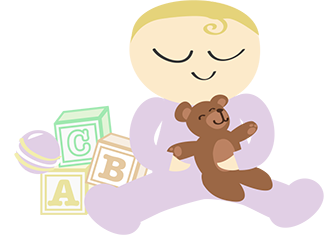 The primary theme in this childbirth method is relaxation. In early November, Amy went out for a run and slipped off the wet curb in front of our house and fell flat. The next day, after being urged by friends, Amy called the Kaiser advice nurse. She said that Amy should come in and get hooked up to a monitor to check on Courtney. Amy didn’t like that idea. By then she could feel Courtney moving around so we decided not to go in. This made Amy wonder about fetal monitoring and it’s safety. In doing extensive research, she found that it can be damaging to the child, and also can indicate false problems that will make “doctors” want to intervene and do all sorts of unnecessary horrible things to mother and child. It was decided then that we would have a home birth. We hired a midwife and had prenatal visits with her as well as continuing them at Kaiser. Continued. It was my birthday on Jan. 24 and one of my gifts was this picture of Courtney. Amy took her to the Picture People at the mall for a 15 shot sitting and the photographer did a great job. They had been using film, but now they use digital and the quality of the pictures and prints is far better now. Plus they email all the shots to you. If anybody would like to wallow in my self indulgence and see all the pictures from the sitting, click here.